The Delhi Crime Branch has written to Google for details of the e-mail address from where the Central Board of Secondary Education chairperson was sent a mail on the Class 10 mathematics paper being leaked, police officials said. The board’s chairperson Anita Karwal had received the e-mail a day before the mathematics exam, which was held on March 28, they said. The Delhi Police has written to Google to share details of the ID from which the CBSE chairperson was sent the e-mail about the paper being leaked, the police officials said. The e-mail contains images of 12 pages of handwritten question papers, which were posted on WhatsApp groups, they said. In the complaint pertaining to the mathematics paper, the board has said that a day before the exam, an e-mail was received on the CBSE chairperson's official ID informing about the leak, the officials said. In the mail the sender had stated that the mathematics paper was leaked on WhatsApp and that it should be cancelled, they said. The mail also contained attachments of the handwritten mathematics paper leaked on instant messaging application, according to the complaint. The mathematics and economics exams were held on March 28 and March 26 respectively. “The papers (economics and mathematics) were shared on over 10 WhatsApp groups, comprising 50-60 members. These groups have been identified. Four numbers that the CBSE mentioned in their complaints were used to circulate the Class 12 economics paper. The numbers were of tutors,” an official privy to the probe said. The police have questioned 45 people since Thursday, including the administrators of the 10 WhatsApp groups, a coaching centre's owner, 18 students and some tutors, in connection with the CBSE paper leak case, he said. 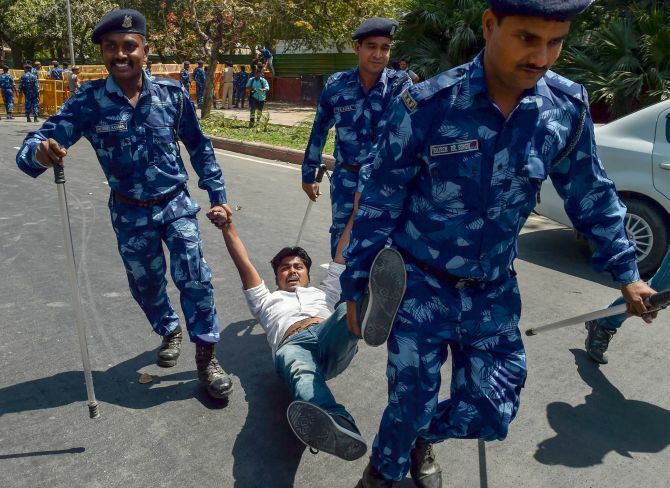 Six students were detained in Chatra, Jharkhand, on Friday in connection with the leak, police said. "Six students have been detained. An FIR has been lodged against four,” Chatra Sub-Divisional Police Officer (SDPO) Gyan Ranjan said, adding that no arrest was made so far. The questioning in the case is taking place at two Crime Branch offices. There has been no breakthrough in determining the point of origin of the alleged leak of Class 10 mathematics and Class 12 economics papers. Police personnel on Thursday had also ‘interacted with the CBSE controller of examination for two hours’ to understand the process of conducting exams, the official said. He said things like how the paper is set, details of where the question papers are kept and how they are distributed to various examination centres were discussed. A Special Investigation Team comprising two deputy commissioners of police, four assistant commissioners of police and five inspectors has been set up to investigate the matter. The team is being supervised by the joint commissioner of police (crime). The CBSE has submitted to the police details of the examination centres sought by its Crime Branch. The police had sought details of the examination centres, their superintendents and the contacts of banks where the papers were kept for safe keep. Police said the board has furnished the details pertaining to both Delhi and Haryana to them. 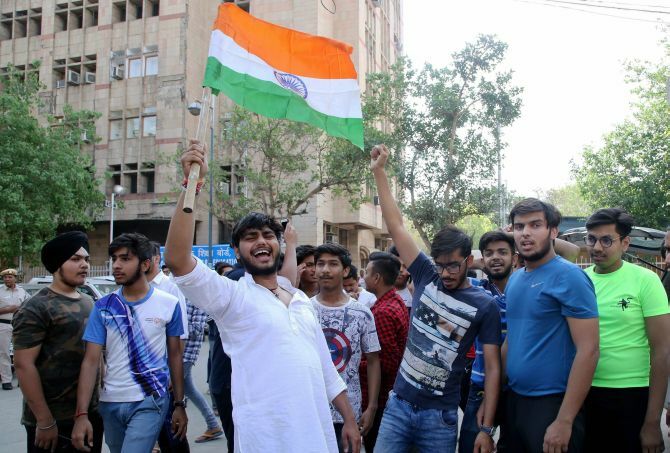 Meanwhile, students and Congress youth leaders on Friday held protests in several parts of the national capital, accusing the board of negligence and demanding immediate action against the guilty. 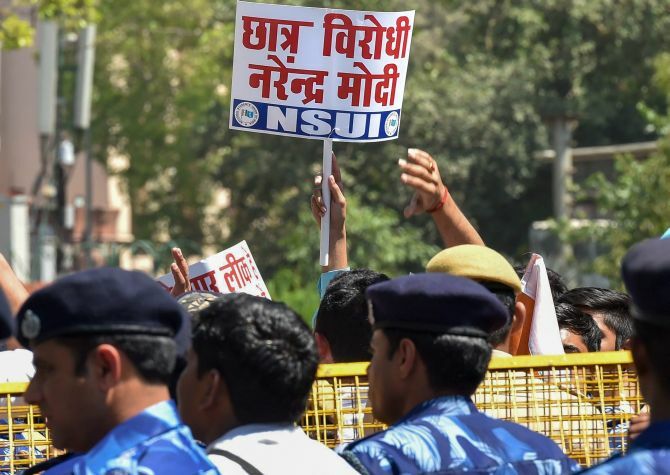 While some students gathered at Parliament Street in the heart of the city, members of the Congress’ National Students Union of India began marching towards Union HRD Minister Prakash Javadekar's residence but were stopped. 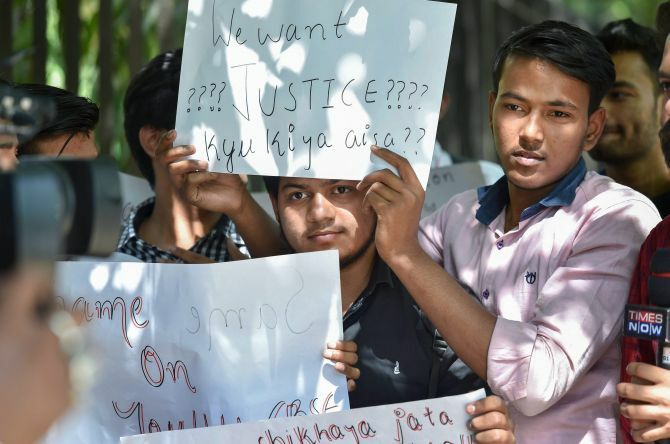 Student groups and the Delhi Pradesh Congress Committee also demonstrated outside the CBSE headquarters in east Delhi's Preet Vihar, raising various demands, including an independent investigation. Though the NSUI march was stopped at the Udyog Bhawan metro station, a short distance from Javadekar's Kushak Road residence, NSUI president Fairoz Khan and Delhi University Students’ Union vice president Kunal Sehrawat were taken by Delhi Police to meet the minister. A delegation of the Rashtriya Swayamsevak Sangh-backed Akhil Bharatiya Vidayrthi Parishad also met the union minister raising similar demands, including necessary procedural changes to ensure ‘leak-proof’ exams and early declaration of the retest dates keeping in mind other competitive exams, said a leader. Facing flak over the paper leaks issue, Javadekar on Friday turned to students for finding a solution to this ‘challenge’. "I am facing one problem in the country. It is a problem of paper leak. So, how to solve it is also a challenge. And I am throwing this challenge to students. Some people can also work after Hackathon and and give us suggestions," Javadekar said, while addressing students at an event marked to launch the finale of the Smart India Hackathon 2018 (Software Edition). The Union HRD minister, however, said the problem of paper leak was not a subject of this year's Smart India Hackathon, the event during which thousands of students would try to find innovative solutions to the problems being faced by various ministries and departments. Stressing the need to move beyond party politics on the CBSE paper leak issue, Delhi Deputy Chief Minister Manish Sisodia on Friday asked Javadekar to convene a meeting of all state education ministers to discuss ways to stop recurrence of such serious incidents. In a letter to Javadekar, the deputy chief minister said there have been concerns over leaks of several other exam papers and asserted that not only does it affect the future of 26 lakh students, but also puts a question mark on the ‘sanctity’ of the CBSE assessment system. He said if the examination papers are leaked, then undeserving students perform well and hard-working students are left behind, which means the country gets low quality officials, teachers, doctors and engineers. ‘So let us all put our minds together and think of solutions for the national good,’ he wrote in the letter. ‘I request you to immediately convene a day-long brain-storming session of all education ministers, so that we can ensure that such serious incidents do not happen again. ‘This is an issue on which we need to move beyond party politics because every time an examination paper is leaked, be it CBSE, SSB or DSSSB the negative consequences are for the country, not just to any one government or one party,’ Sisodia, who also holds the education portfolio, wrote. ‘While two examinations have been cancelled and re-tests ordered, there have been concerns regarding leaks of several other exam papers as well. ‘Not only does it affect the future of 26 lakh students, but also puts a question mark on the sanctity of the CBSE assessment system; a system on which students, parents and schools from all over the country place their trust,’ he said. ‘I think that it is important that education ministers from all over the country need to sit together and brain-storm about how we can strengthen our assessment and examination systems,’ Sisodia said in his letter to Javadekar.